Home » Food and Nutrition » Alternative Remedies » What Is Ayurveda? One of the oldest forms of alternative therapy is Ayurveda—a holistic healing system that was developed over 3,000 years ago in India. Rather than focusing on treating pre-existing conditions and fighting diseases, Ayurvedic medicine promotes overall good health. Alternative methods are becoming increasingly popular, especially among those who would rather take a more natural route than pharmaceuticals can offer. There are many types of alternative medicine, and they are organized into five main groups by the National Center for Complementary and Alternative Medicine: whole medical systems, mind-body medicine, biologically based practices, manipulative and body-based practices, and energy medicine. The distinction between each category isn’t always obvious, and some complementary and alternative medicine, or CAM, methods use techniques from more than one category. Even doctors have embraced CAM therapies, and often combine them with their traditional medical treatments; this is where the term integrative medicine originated. Ayurveda is based on the belief that one’s health and wellness is based on a delicate balance between the mind, body, and spirit. These ancient Ayurvedic methods are finding new life as more and more individuals become accepting of alternative therapies in 2017. What is Ayurveda? As we’ve mentioned, Ayurveda is an ancient Indian holistic approach to healing. Its name comes from the Sanskrit words ayur, meaning life, and veda, meaning science or knowledge. The main principle of this therapy is that individuals should maintain equilibrium between their mind, body and spirit—when this balance is thrown off, they get sick. When your mind, body, and spirit are in harmony with the universe, you’ll remain in good health—but how can you ensure that all of these elements remain in balance? Those who practice Ayurvedic medicine believe that every person is made of five basic elements that can be found in the universe: space, air, fire, water, and earth. These elements come together in the human body to form three life energies, called doshas. Typically, one of your doshas is stronger than the others, and your susceptibility to developing health issues and getting sick depends on the balance of your doshas. Things that can disrupt your inner equilibrium include genetic or birth defects, injuries, climate and seasonal change, age, and your emotions. The three doshas in control of your mind, body, and spirit are known as vata dosha (space and air), pitta dosha (fire and water), and kapha dosha (water and earth). Vata dosha is perceived as the most powerful of all three—it controls basic bodily functions like cell division. It also has control over your mind, breathing, blood flow, heart function, and the ability to rid yourself of waste through your intestines. This dosha can be thrown off balance by eating again too soon after a meal, fear, grief, and staying up too late. If your vata dosha is your most prominent life force, you can be more susceptible to health conditions like anxiety, asthma, heart disease, skin problems, as rheumatoid arthritis. Pitta dosha controls things like digestion, metabolism, and hormones that are linked to your appetite. Eating sour or spicy foods, and spending too much time in the sun are both things that and disrupt your pitta dosha, and make your more likely to develop life-long conditions like Crohn’s disease, heart disease, high blood pressure, and infections. Kapha dosha is responsible for muscle growth, body strength, stability, body weight, and your immune system. This dosha can be upset by sleeping during the daytime, eating too many sweets, and eating or drinking products that contain too much salt or water. If this is your main life force, then you may be more likely to contract disorders like asthma, other breathing disorders, cancer, diabetes, nausea after eating, and obesity. When you seek Ayurvedic treatment, a practitioner will typically create a treatment plan for you tailored to your specific ailments. They’ll take into account your physical condition, emotional makeup, primary life force, and the level of balance between these three elements. Once they’ve assessed these factors, they will come up with a course of action to re-balance your doshas. The primary goal of their treatment is to cleanse your body of undigested food, which if left to linger in your system, can lead to illness. The cleansing process known as “panchakarma” is specifically designed to reduce your symptoms and restore harmony to your inner life forces. The tools that an Ayurvedic practitioner might use to achieve this can include blood purification, massage, medical oils, herbs, or enemas and laxatives. There are state-approved schools in the U.S. that offer Ayurvedic programs, but there is no national standard training or certification for those who want to pursue this alternative medicine as a career. In fact, it’s important to note that the FDA does not review or approve any Ayurvedic products on the market, and has actually banned certain ones from entering the country since 2007. Always speak to your doctor before trying an integrated or alternative medicine approach, to make sure it’s best for you. Alternative therapies and medicines are certainly becoming increasingly popular—but Ayurveda isn’t the only alternative method to treating your ailments. Traditional Chinese Medicine is another quite popular approach to alternative medicine. Traditional Chinese Medicine, or TCM focuses on have balance, harmony, and energy in your life to maintain your health—much like Ayurveda. TCM places importance on the balance of yin and yang; yin being described as hot, light, feminine, and hollow, and yang as cold, heavy, masculine, and solid. Another popular form of alternative medicine is homeopathy. This approach uses small doses of substances that cause symptoms to stimulate the body’s natural self-healing response. This natural health care is especially popular in India and South America. Its treatment process selects the best suited medicine for each individual’s specific set of symptoms, and current level of health. 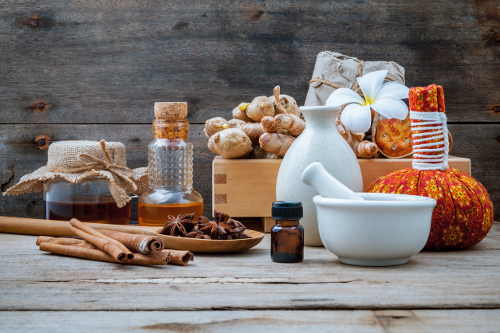 Additional forms of alternative medicine include acupuncture, naturopathy, and aromatherapy. Chopra, “What Is Ayurveda?,” The Chopra Center; http://www.chopra.com/articles/what-is-ayurveda?sso_redirect=1&sso_code=eyJpdiI6IlwvcFB1MzBxK2p6TnpJb0MzNlgyYlZnPT0iLCJ2YWx1ZSI6InlRVUdOVm5leWJwSlF0MUoxU1h4SWFKTEpOaTZhMGVpTzd1V2lFTXRDaDR2bUZtaW5tSlVqa3U1N2tnRk4waWxqaW9jZGR2dE9TXC8xOEF2ZkR4VTR1V2hMVkF1a0dcL01hUUZBUTZWSkxZUUk9IiwibWFjIjoiNWVlN2M3ZGI4YmM0ODJmNGQxNTA1Y2M5YWVjOTBlY2FjMzQ5ODNhNDIxMmE3MDA0MDFmMmIwNTU2YjY3MmRkOCJ9#sm.0001vg1uqe9z5e4wyaw2o4paolx0u, last accessed May 18, 2017.